At Overwatch fan site Kotaku, we have a whole Slack room dedicated to the eponymous first-person shooter/dating sim. In it, we post memes and strategy tips and argue over who to ship Lucio with. 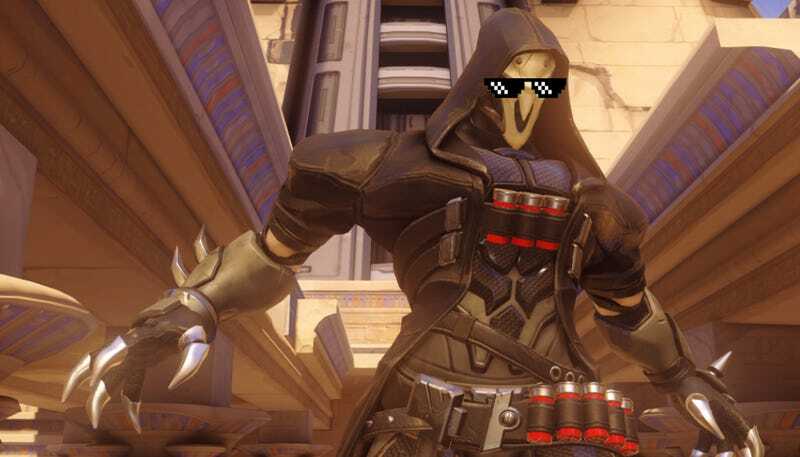 One day in Kotaku_Overwatch Slack, Gizmodo writer Bryan Menegus asked whether Reaper would be into the metal band Slipknot. Somebody, and it was probably not me, posted a Mindless Self Indulgence song, insisting Reaper would in fact be into dated electro-punk. We continued to argue until Kotaku reporter and Pharah fanboy Nathan Grayson suggested we start the Slack room Reaper_Soundtracks. Bryan suggested we call it Edgelord_Bangers. Thus, the Slack room Reaper_Bangerz was born. Kotaku East writer Luke Plunkett, who is hugely into metal, later joined. Reaper_Bangerz was originally where we posted songs we think Reaper mains might blast in their parents’ basement while they’re wraithing around Dorado as XxDeAtHlOrDxX. But because we are, in fact, self-respecting music fans, a lot of what we posted turned out to be great. So, I present you with our first Reaper_Bangerz playlist. It’s a collection of post-rock, doom, stoner rock, metal and psychedelic curated for you, XxDeAtHlOrDxX. Death comes for us all. Post your Reaper Bangerz in the comments!